The Siege of Dunboy took place at Dunboy Castle on 5–18 June 1602, during the Nine Years' War in Ireland. It was one of the last battles of the conflict and was a victory for the English Army. Dunboy Castle is situated near the town of Castletownbere, on the Beara Peninsula, Co. Cork, in south-western Ireland. It was a stone tower house, built to control and defend the harbour of Bearhaven, which was a stronghold of Donal Cam O'Sullivan Beare, a Gaelic clan leader and the 'Chief of Dunboy'. O'Sullivan was part of a confederation of Gaelic leaders who had gone into rebellion against Elizabeth I of England. He was aided by King Philip III of Spain, who sent an invasion force to Kinsale under the command of Don Juan del Águila. After Águila had surrendered to the queen's Lord Deputy, Lord Mountjoy, in January 1602, O'Sullivan resolved to continue the fight and rallied his forces at Dunboy. O'Sullivan first had to recover possession of his castle, which was garrisoned by a small force of Spanish troops under the command of a Captain Saavedra. In February, as part of the terms of Águila's surrender to Mountjoy, Saavedra was preparing to hand the castle over to English forces when he and his men were overpowered and disarmed by O'Sullivan (who later released them for transportation back to Spain). O'Sullivan kept all of their arms, ordnance and munitions, and immediately strengthened the castle in readiness for the inevitable assault. He left a force of 143 of his best men to defend the castle in his absence under the charge of Captain Richard MacGeoghegan and Friar Domenic Collins. The English crown sent a 5000-strong army under the command of Sir George Carew, Lord President of Munster, to suppress the resistance. Carew also had the support of the English navy. But before the siege got under way, O'Sullivan himself and most of his forces had already marched to another of his fortresses, Ardea Castle, on the northern coast of the Beara promontory in order to secure money and supplies that had just arrived by ship from Spain. Carew began the siege with an artillery bombardment by land and sea. One of O'Sullivan's cousins, who had allied himself with Carew, Owen O'Sullivan of Carrignass, informed the English commander of a weak point in the castle walls at a stairwell. The guns were directed to that point, and the walls were eventually breached. By the 10th day the castle had been reduced to ruins. Richard Mac Geoghegan, whose son Bryan had been killed, sent a messenger to Carew requesting terms. Under the rules of war, however, unconditional surrender was required once the battle commenced. Carew responded by hanging the messenger in sight of the defenders. Certain of their fate should they remain, some of the defenders swam to nearby Bere Island, where they were killed or captured in the water. The remainder repelled another assault and sealed themselves in the cellar of the castle as the siege continued. 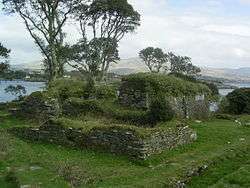 Meanwhile, crown forces raided nearby Dursey Island, where O'Sullivan families resided. On the 11th day, the castle cellar was finally overrun amid vicious hand-to-hand fighting. MacGeoghegan was hacked by Captain Power as he attempted to ignite the powder stores and blow up the cellar. All but three of those captured during the final assault were hanged in the market square in nearby Castletown Berehaven: of the remaining captives two were hanged on failing to give information, while Friar Domenic Collins was interrogated by Carew, who demanded he take the oath of supremacy prior to execution. Collins was then taken to Youghal and hanged. After Dunboy fell, O'Sullivan went on a campaign of guerrilla warfare around West Cork, taking at least six castles. Faced with overwhelming odds and starvation, he set out on a tough march to join his allies in the north of Ireland, with 1000 men, women and children in his train ("O'Sullivan's March"). O'Sullivan's people were besieged by enemies and the elements throughout the long journey. On their arrival at the refuge of O'Rourke's castle in Leitrim, only 35 remained, many having died in battles or from exposure and hunger. Others had settled along the route, where their descendants are known to this date as 'the Beres'. In Leitrim, O'Sullivan sought to join with other northern chiefs to fight the English and organised a force to this end, but resistance ended when the Earl of Tyrone successfully sued for peace and swore an oath of loyalty to the English crown. O'Sullivan declined this option and sought exile in Spain, where he was later murdered. 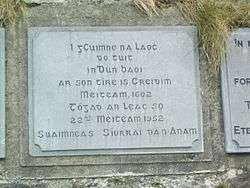 Pól Uí Súileabháin, "The Last Chieftain of Gaelic Ireland: The True Story of Donal O'Sullivan Beare", Published 2004 with the assistance of the Beara Historical Association. Standish O'Grady (ed. ), "Pacata Hibernia", Vol II, London 1896. T. D. Sullivan, "Bantry, Berehaven and the O'Sullivan Sept", Tower Books, Cork, 1978. Barry O'Brien, "Munster at War", The Mercier Press, Cork, 1971.